Definition at line 39 of file DerivedTypes.h. This enum is just used to hold constants we need for IntegerType. Minimum number of bits that can be specified. Maximum number of bits that can be specified. Note that bit width is stored in the Type classes SubclassData field which has 24 bits. This yields a maximum bit width of 16,777,215 bits. Definition at line 49 of file DerivedTypes.h. Definition at line 43 of file DerivedTypes.h. Definition at line 91 of file DerivedTypes.h. If an IntegerType with the same NumBits value was previously instantiated, that instance will be returned. Otherwise a new one will be created. Only one instance with a given NumBits value is ever created. Get or create an IntegerType instance. Definition at line 239 of file Type.cpp. References assert(), llvm::Type::getInt128Ty(), llvm::Type::getInt16Ty(), llvm::Type::getInt1Ty(), llvm::Type::getInt32Ty(), llvm::Type::getInt64Ty(), llvm::Type::getInt8Ty(), llvm::LLVMContextImpl::IntegerTypes, llvm::LLVMContext::pImpl, and llvm::LLVMContextImpl::TypeAllocator. Referenced by atomicSizeSupported(), BinomialCoefficient(), BitCastConstantVector(), llvm::MachineIRBuilder::buildConstant(), llvm::slpvectorizer::BoUpSLP::canMapToVector(), CanShareConstantPoolEntry(), CheckMACMemory(), llvm::VNCoercion::coerceAvailableValueToLoadTypeHelper(), collectInsertionElements(), llvm::ConstantFoldBinaryInstruction(), llvm::ConstantFoldCastInstruction(), llvm::ConstantFoldCompareInstruction(), llvm::ConstantFoldSelectInstruction(), llvm::ConstantFoldShuffleVectorInstruction(), createAccessTag(), llvm::DIBuilder::createBitFieldMemberType(), llvm::DIBuilder::createInheritance(), llvm::MDBuilder::createRange(), DecodeFixedType(), llvm::Evaluator::EvaluateBlock(), llvm::SCEVExpander::expandUnionPredicate(), ExtractConstantBytes(), llvm::FastISel::fastEmit_ri_(), foldICmpShlOne(), llvm::ConstantInt::get(), getAccessType(), getAsConstantIndexedAddress(), llvm::VectorType::getExtendedElementVectorType(), getFoldedAlignOf(), getFoldedSizeOf(), llvm::DataLayout::getIndexType(), llvm::VectorType::getInteger(), llvm::Type::getIntNTy(), llvm::DataLayout::getIntPtrType(), llvm::VNCoercion::getLoadValueForLoad(), GetLoopInvariantInsertPosition(), getMemCmpLoad(), llvm::VNCoercion::getMemInstValueForLoadHelper(), getNegativeIsTrueBoolVec(), getRangeForAffineARHelper(), getRelevantOperands(), llvm::ScalarEvolution::getSignExtendExpr(), llvm::VNCoercion::getStoreValueForLoadHelper(), llvm::slpvectorizer::BoUpSLP::getTreeCost(), llvm::VectorType::getTruncatedElementVectorType(), llvm::EVT::getTypeForEVT(), llvm::ScalarEvolution::getUDivExpr(), llvm::ScalarEvolution::getURemExpr(), llvm::X86TTIImpl::getUserCost(), llvm::ScalarEvolution::getZeroExtendExpr(), INITIALIZE_PASS(), instrumentMaskedLoadOrStore(), isAddRecSExtable(), isAddSExtable(), IsIncrementNSW(), IsIncrementNUW(), isMulSExtable(), llvm::LegalizerHelper::libcall(), LLVMIntTypeInContext(), lookThroughAnd(), llvm::HexagonTargetLowering::LowerBITCAST(), llvm::Intrinsic::matchIntrinsicType(), optimizeMemCmpConstantSize(), llvm::TargetLowering::ParseConstraints(), performMaskedAtomicOp(), processUGT_ADDCST_ADD(), llvm::LoopVectorizationCostModel::setCostBasedWideningDecision(), switchToSelect(), llvm::InnerLoopVectorizer::truncateToMinimalBitwidths(), TypeSizeToSizeIndex(), unifyBitWidth(), llvm::slpvectorizer::BoUpSLP::vectorizeTree(), and llvm::InstCombiner::visitSwitchInst(). Return a bitmask with ones set for all of the bits that can be set by an unsigned version of this type. This is 0xFF for i8, 0xFFFF for i16, etc. Definition at line 69 of file DerivedTypes.h. Definition at line 65 of file DerivedTypes.h. Referenced by calculateOffsetDiff(), CheckMACMemory(), llvm::SanitizerStatReport::create(), llvm::IRBuilder< TargetFolder >::CreateExtractInteger(), DecodeFixedType(), llvm::ARMTargetLowering::ExpandInlineAsm(), llvm::X86TargetLowering::ExpandInlineAsm(), extractInteger(), findCommonType(), foldSignedTruncationCheck(), generateUnsignedDivisionCode(), llvm::ConstantInt::get(), getBitMask(), llvm::Type::getIntegerBitWidth(), getSignBit(), getTypePartition(), llvm::haveNoCommonBitsSet(), INITIALIZE_PASS(), insertInteger(), isLoadOrStore(), llvm::PPCInstrInfo::isSignOrZeroExtended(), LLVMConstIntOfArbitraryPrecision(), NoopOrExtend(), llvm::recognizeBSwapOrBitReverseIdiom(), llvm::Constant::removeDeadConstantUsers(), replaceAllUsesOfWithIn(), llvm::WholeProgramDevirtPass::run(), switchToSelect(), llvm::sroa::AllocaSliceRewriter::visit(), llvm::Interpreter::visitAShr(), and llvm::InstCombiner::visitICmpInst(). a bit mask with ones set for all the bits of this type. Get a bit mask for this type. Definition at line 268 of file Type.cpp. References assert(), llvm::Type::ContainedTys, llvm::Type::FunctionTyID, llvm::APInt::getAllOnesValue(), getBitWidth(), llvm::Type::getContext(), llvm::Type::NumContainedTys, llvm::Type::setSubclassData(), llvm::ArrayRef< T >::size(), and llvm::Type::Type(). Return a uint64_t with just the most significant bit set (the sign bit, if the value is treated as a signed number). Definition at line 75 of file DerivedTypes.h. References getBitWidth(), getMask(), and isPowerOf2ByteWidth(). This method determines if the width of this IntegerType is a power-of-2 in terms of 8 bit bytes. true if this is a power-of-2 byte width. Is this a power-of-2 byte-width IntegerType ? Definition at line 263 of file Type.cpp. 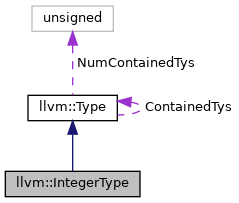 Definition at line 40 of file DerivedTypes.h.